Compared to paper records, which may be incomplete or inaccurate, DNA testing is precise. 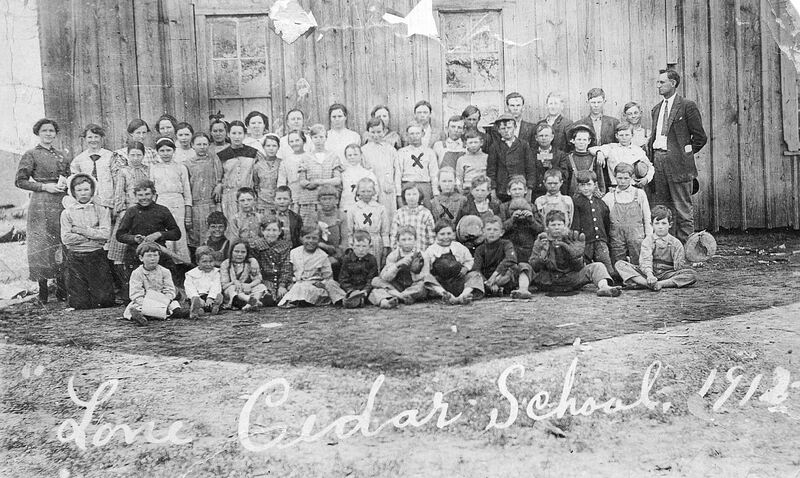 If you take a DNA test, you can find out who your great-great grandparents were? An autosomal DNA test can help you identify genetic cousins, but it can’t tell you exactly how you are related to those cousins. Your DNA testing company will provide an estimate of your relationship, indicating that you are 3rd cousins, or perhaps even more vaguely, 3rd to 5th cousins. It is left up to you to figure out how. This is no small feat. For example, you and a third cousin should share a common set of 2X great grandparents. 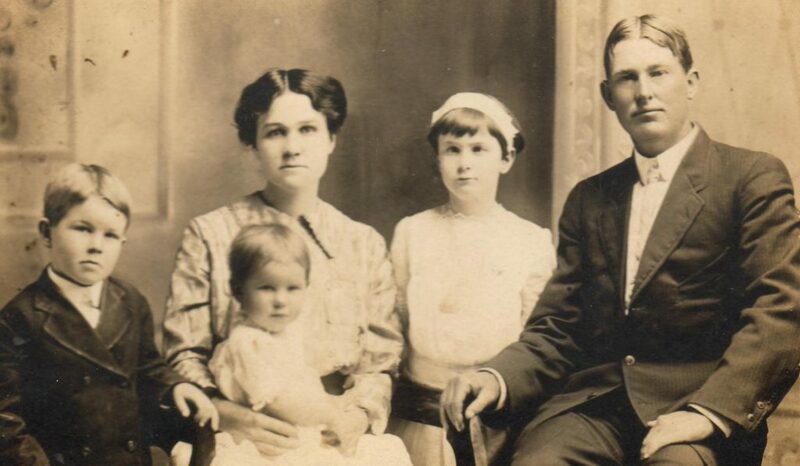 You have 8 sets of 2X great grandparents, meaning that you have to figure out which one of the 8 sets is the one connecting you. How do you accomplish this? Well, you do genealogy! If another descendant of your great-great grandparents has been tested, and this DNA match has a paper trail, they might indeed be able to help you connect to them. You could also use Y-DNA to help you in your search. However, one limitation of Y-DNA is that even with a perfect match in most cases you can’t determine whether you’re related through your 2X great grandfather or a more distant ancestor, unless you can find the records to prove your hypothesis. Likewise, you could employ mtDNA to help, but you would have to be very targeted. For example, if you know that Janice is a documented direct maternal descendant of the 2X great grandparent couple that you believe to be descendent from, and you believe you too are their direct maternal descendant, then you could compare Janice’s mtDNA to your own. If you match, there is a good chance that you are on the right track. 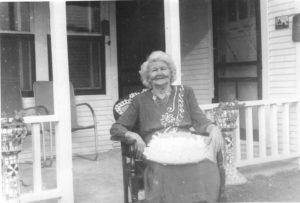 The answer then, is yes, DNA testing can be a great tool to help you find your 2X great grandparents, but it will also take a significant amount of good ol’ fashioned genealogy research. I would like to invite you to participate in the Taylor family Y-DNA project. This is a “special interest group” and it covers all Y-DNA members with the surname of Taylor. You may find that even if you do not have the Taylor Surname you still belong in the Taylor group. Wince we most likely will not all belong to the same Haplogroup, the administrators separate us into our own family groups based on our Y-DNA test results which allows us to look at each other’s Y-DNA and see where the similarities and differences are. This allows you to interpret the results a bit better and with additional members will eventually allow us to identify branches within our genetic families. The Taylor project sometimes has a better price for FTDNA testing for project members than what is out there for the “non project members.” You do need to join the project in order to benefit from the different pricing structure for testing. 1. 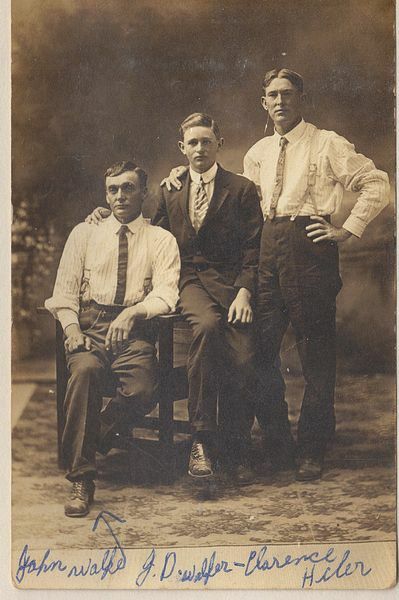 To join the project go to https://www.familytreedna.com/my/group-join?group=Taylor or log into your ftDNA home page where you click on Projects or myProjects and then join the project. Choose T and then Taylor and it will walk you through the process. Whether or not you have already tested you can order your initial test or upgrade your testing level here. At times ftDNA’s sale pricing may be better than the standard discount offered to a member of the Taylor DNA project. 3. From the Taylor project site you can click on the “Join” button link on the right hand side of the top banner/picture. 4. On the page that comes up, select Option B “Order a test” & click the orange link. 5. Choose the Y-## of your choice from the list of options. 6. Complete the process by entering required information, including payment. If you have already tested the Y-37 with FTDNA and you are at a “brick wall” with your research, you might consider having FTDNA expand the number of markers tested to 67 or 111. This would not entail another swab, rather just having them test the existing sample to a higher number. There would be a second discount, since you have already paid for the 37 they discount the upgrades taking the first tests into account so they are testing fewer markers. You see that discount when your go through the process of choosing the next level of test. By expanding the number of markers tested it both optimizes your search field in two ways. First, because several other Taylors have taken the 111 test, it gives you a benchmark to compare your new results against. For example, while at 37 if you are one marker different from one match, and zero from a second match, the more markers tested allows for a more complete family picture. For example, two samples may have very close results at 12 and 25 markers, but as the markers tested increase you may start to see more differences at 37, 67, and eventually 111 markers. This gives us you and another match a generational time frame to look in to see when your most recent common ancestor may have lived in and is what has led Johnny and I to William Taylor of New Jersey that moved to North Carolina in the mid 1700’s. In your case the expanded testing may do the same thing. It may wind up that you remain very close, or with no difference, all the way out to as far as you test, or there may be greater separation from Johnny yet stay closely aligned to my results, or somewhere in between. With that information then we may be able to triangulate in on a time frame of when to look for that most recent common ancestor. Second it provides an opportunity for matching to another Taylor more closely than either Johnny or I and that Taylor may have a more complete lineage paper record that would provide more clues as to your Taylor line. A third item, and a second test, to consider. We have found that, as Haplogroup G descendants of a single male Taylor in the early mid to late 1600’s and early 1700’s, it appears that we have a unique single marker to test that provides what we could call “proof of lineage”. This marker we find to be common among all of us that have tested for it within our specific line. We share other markers in the SNP tree as well but this one is the deepest so far identified as common between all of us that have tested for it. The SNP test is not a single option that replaces all standard Y-DNA tests, it is rather the clincher for our line. Other families also have SNP – M3302 such as the Browns and others, but in combination with our Y-DNA (which is different from the Brown’s) it has become our touchstone for the Monmouth New Jersey Taylors. This marker is what is known as a Single Nucleotide Polymorphism (SNP for short), called M3302. Testing positive for this SNP is something that we have seen we have in common and takes us to a common point deep within the HpG structure/tree. The cost for testing one SNP with FTDNA is about $40.00 if you have already taken one of their Y-DNA tests. Another option, which a few of us have chosen to do is to do what is called a ‘deep clade’ test which tests, when I did it, over 100 SNP’s so it provides the trail from HpG-M201 (this is the highest level common marker we all share in Haplogroup G – M-201 is what distinguishes Haplogroup G from all other Haplogroups) all the way down following the trail to the deepest level that the tree currently goes in our particular branch (we are still breaking ground every year with new discoveries). One of the cousins has participated in some extra tests and his deepest marker is now below M3302. He and I participated in the “mapping” of Haplogroup G several years ago and as they discover where these SNP’s lie within the Haplogroup G “tree” then they come back and add these new markers placing us deeper and deeper within the tree. This is important to us because it can show us where a family tree lineage may branch off and help delineate the children of Joseph from the children of William from the children of John or George. That’s the someday part of the Y-DNA science/testing. As I mentioned, testing for one SNP is about $40.00, the Deep Clade test of HpG is, or was, about $99 or $109, but you have to work with a project administrator like Ralph Taylor to get that testing and the current cost thereof. The topic of who was the father of William Taylor Sr. has long been tossed around and argued among his descendants. Even renowned author, Ardis Taylor, who wrote six books about William and his descendants was never comfortable in accepting and naming Francis Taylor III as William’s father and George of Carlisle as the family’s immigrant ancestor. 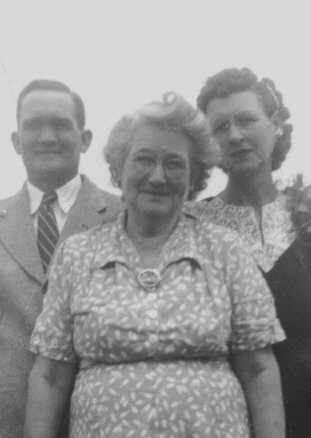 Now, in 2018, thanks to the advances of genetic genealogy and to a lesser degree, a preponderance of circumstantial evidence, we can safely name the father of William Taylor Sr. as being Joseph Taylor (b. 169? d. 1748) of Monmouth County New Jersey. As a means to keep them separate, let’s designate a NJ William Taylor and a NC-GA-TN William Taylor. Geography …. Historians wrote that NJ William Taylor, son of Joseph Taylor of Monmouth County New Jersey moved to North Carolina and was never heard from afterwards. The earliest record we have of NC-GA-TN William Taylor is when his first six (of nine) sons were each born in North Carolina over the years of 1763 to ca. 1780. 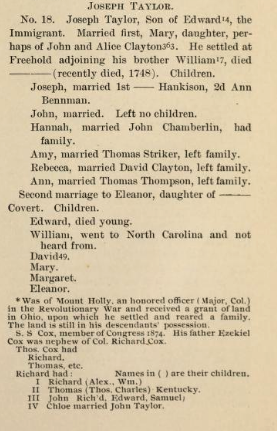 To further support the argument of a NJ to NC migration, we know that NJ William’s sister, Eleanor, also moved to NC and married Edward Walker and we are able to locate a Tyrell Co. NC marriage certificate dated 1763 proving the marriage. This not only supports the geography aspect but also the timeframe since the marriage was in 1763 and NC-GA-TN William Taylor’s first son was born in NC in 1763. Timeframe …. The NJ William Taylor and the NC-GA-TN William Taylor are of the approximate same age and both are in North Carolina at the same time. 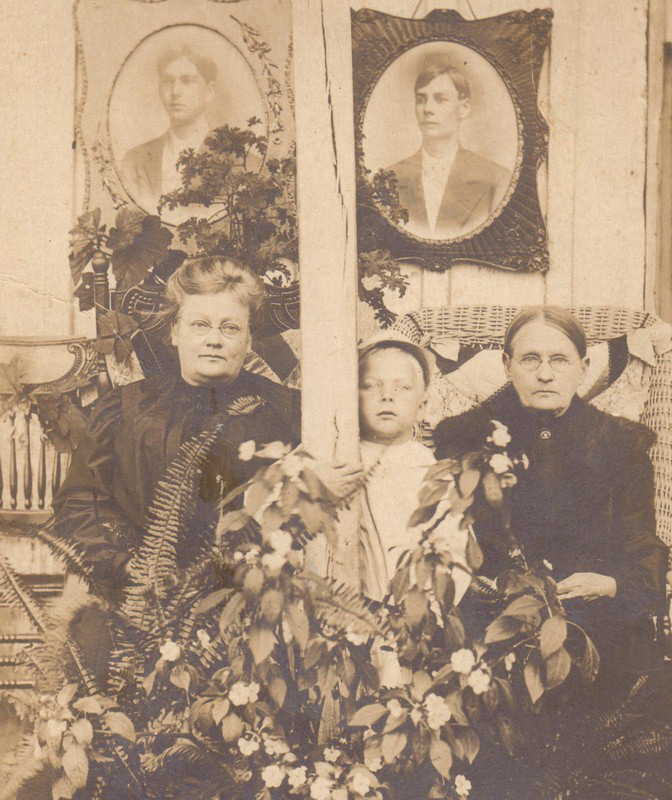 Genealogical Information …. 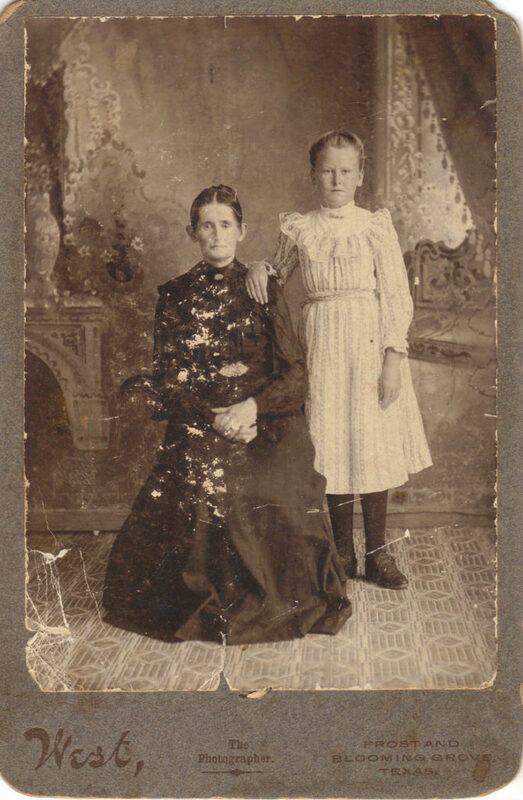 Descendants from both the NJ families and the TN families have extensive documentation and research to support their pedigree claims. The NJ clan has several published histories with one in the works. The TN clan has a series of books authored by Ardis Taylor which contain some inaccuracies (now identified by DNA testing) but still provides a very workable foundation. yDNA …. Descendants from both the NJ families and the TN families have submitted to yDNA testing and the results indicate that they all are predicted to be in the G Haplogroup (HpG) also designated as G-M201. HpG only makes up about 1.5% of the Taylor population of the British Isles and is only slightly higher, at 2.5% of the entire world. Advanced yDNA testing can further narrow the sub-group within the haplogroup. 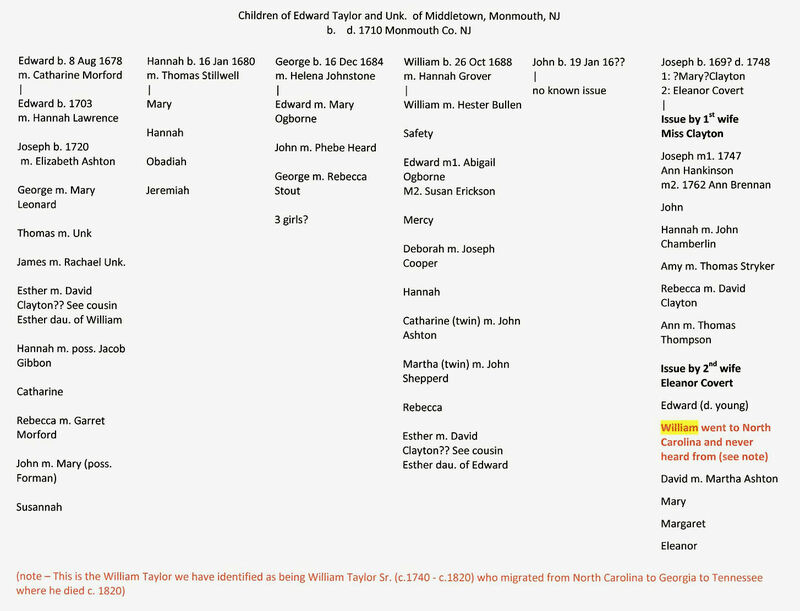 Descendants of different branches of the family of Edward (the immigrant) Taylor d. 1710, of Middletown, Monmouth, NJ, have participated in Y-DNA testing. The results indicate that HpG-M3302 is currently the unique identifier common to the Monmouth NJ family of Taylors. Currently HpG M3302 is the unique identifier which separates the Monmouth Taylors from other Taylor families in America. As of April 2018 only one descendant from the TN clan has submitted to the advanced testing and my results indicate that I am HpG-M3302. Measures are now being taken to encourage other descendants from the TN clan to take the advanced test(s). Genetic Distance (GD) also plays an important role in identifying relationships. A GD of 0 means a 37/37 match in markers (i.e. a Y-37 test from FTDNA.com) between two men who share a common surname means they share a common male ancestor. A GD of 1 or 2 (i.e. <3) also means a shared common ancestor on a generation or two farther out. ALL of the male descendants who have tested with FTDNA.com have GDs of 0 to 2 with each other indicating that all share a common male ancestor. Overall, our genetic markers are so similar that yDNA test results suggest a recent (within the last 5 to 7 generations) connection to a common ancestor linking the Monmouth NJ Taylors and certain Taylors from NC, GA, and TN. More importantly, it supports the evidence that William Taylor Sr. who died in DeKalb Co. TN is the same William who left his home in NJ and was “never heard from again” by his NJ family. And finally, this establishes William Taylor Sr. as being the “missing haplogroup G link” between the NJ and TN families as well as provides us with the name of William’s father, Joseph Taylor of Monmouth NJ b. 169? D. 1748! In addition, we can now identify our Immigrant Ancestor as Edward Taylor (b. unk, England – d. 1710, Middleton, Monmouth, New Jersey). The history of the Monmouth NJ Taylor family, most likely due to their prominence in NJ and NY, was well documented and published by at least six genealogists and a new publication is scheduled to be released soon. To familiarize yourself with the Monmouth line, I suggest you read online and/or download these two genealogies. They are in PDF form and the downloads are free. A word of caution … it is suggested that you not record [onto your tree] any of the family data earlier than our Immigrant Ancestor, Edward Taylor, who died in Monmouth Co. NJ in 1710. Almost all of these early publications had errors in Edward’s ancestory and this should be corrected when the new publication becomes available. Family chart of the children of Edward Taylor the Immigrant. CLICK ON THE CHART TO ENLARGE IT. To help you get started with the Monmouth line, I have posted above a family chart of the children of Edward Taylor the Immigrant. It can be downloaded HERE as a Word docx file and/or HERE as a pdf file. 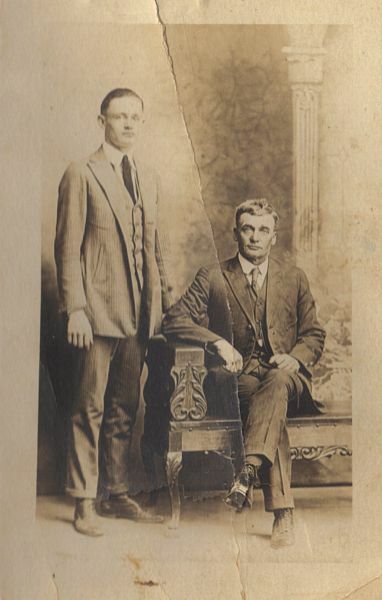 I am desperately trying to locate living male descendants of these brothers who have had their yDNA tested or might be willing to take the Y-37 test with FamilyTreeDNA.com and participate in the Taylor DNA Project. Please use the Contact Page to send me an email message if you can help with this project. This is actually a postscript to my posting on May 22, 2017 entitled, On The Taylor Trail Again. When I took my first yDNA test (the Y-37) with FamilyTreeDNA.com, I never dreamed of what the results would reveal. I am in Haplogroup G which is pretty rare since only 3% of Taylors are Hp G. I have since upgraded to the Y-67 test, the G-pack SNP test, and I am currently waiting for the results of my Y-111 upgrade. 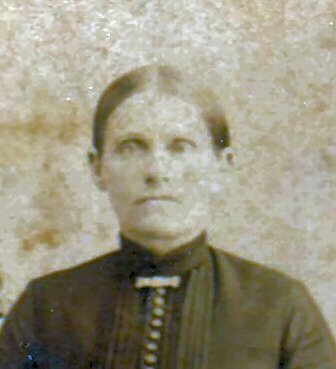 FamilyTreeDNA has identified 5 individuals whose yDNA results are identical or almost identical to mine. At least 3 of the individuals have conducted advanced genealogy research on their family history and all three trace their (proven) lines to Edward Taylor who traveled from England and settled in Monmouth New Jersey in 1680, he died there in 1710 and the Monmouth County New Jersey Taylor’s remained in that area for several generations. The fourth yDNA match has chosen not to communicate with the group and the fifth individual has done little genealogy research but it appears that he will be a proven descendant of Henry H. Taylor (1780-1835) of DeKalb Co. TN. The bottom line to this brief discussion of the yDNA test results is this … THE Y-DNA TEST RESULTS INDICATE THAT I AM A DESCENDANT OF THE MONMOUTH NJ TAYLOR’s. One of my new cousins has helped me formulate the WILLIAM TAYLOR OF MONMOUTH THEORY which I will expound on in a soon-to-be-published blog post …. In the meantime, let me give you the very condensed version …. In the mid-1700’s it is documented that one William Taylor of Monmouth Co. New Jersey departed NJ for North Carolina and was never heard from again by his NJ family. I theorize that this William Taylor traveled from NJ to NC to GA and ended up in Smith (later DeKalb) Co. TN where he became one of several William Taylor’s in the county with a family. I further submit that he had several (if not all) of the sons we attribute to William Taylor Sr. of the Ardis Taylor books. Already, three test results support this theory: (1) mine, with my ancestor being Drury Taylor (son of William), (2) match #5 mentioned above whose ancestor is Henry H. Taylor (son of William) and, (3) Subject Two named in my previous post whose ancestor is Barzilla Taylor (son of William). At least four descendants of William Taylor’s sons will receive their yDNA test results in the next 2 to 4 weeks and those results will either “make or break” this theory. Sometimes you follow a road a long way until you think you’ve finally reached your destination. Then, years later, you realize that you are at the wrong destination so you find yourself on the road again. I suspect this situation happens a lot more in genealogy than most people want to admit. And, I suspect it will begin to happen with greater frequency as we combine DNA research with genealogy research. My family group of Taylors have, since 2003, been of the belief that our Immigrant Ancestor was George Taylor of Carlisle who was born in England in 1615 and sailed to Virginia in 1635. Long before George of Carlisle was written into our family history books we had arrived at the fact that William Taylor (c.1729-1820) of DeKalb County Tennessee was our oldest known ancestor. 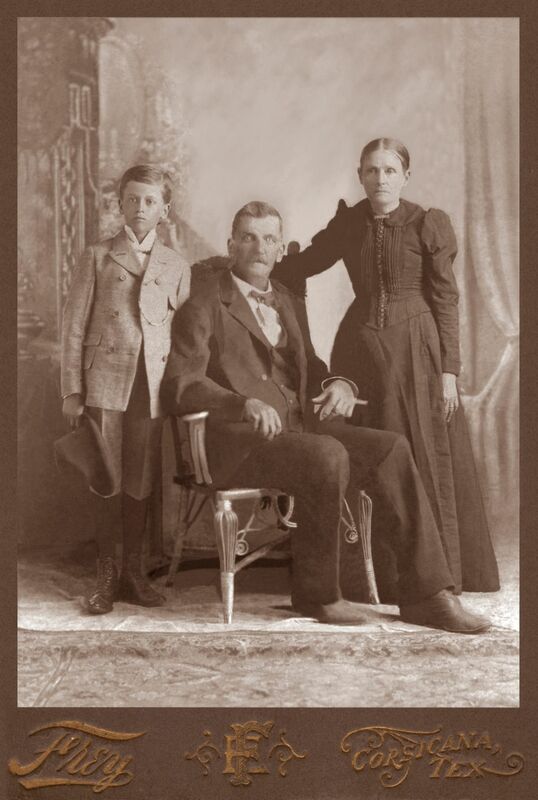 We had carefully studied his descendants and their genealogy facts, stories and legends were recorded in a series of books authored by Ardis Taylor of Lisbon, North Dakota, from 1980 to 2012. Since the first three generations of the descendants of George of Carlisle are well documented from George to Francis Sr to Francis Jr to Francis III then we were assuming that if George was our Immigrant Ancestor, then his g-grandson, Francis III was the father of our William Taylor Sr. Unfortunately, this now does not appear to be the case! In 2012 I became a participant in the AncestryDNA program managed online by Ancestry.com. As the years went by, I received dozens of DNA match notifications with other program participants. Since these were matches based on Autosomal DNA (atDNA) they really amounted to just strong hints that I was likely related to a particular fellow member of the program. Ironically, when I would examine the fellow member’s pedigree tree, I would find that his/her “sourced” research always stopped with one of the sons of William Taylor Sr., or occasionally William Taylor Sr. himself. Not even one of the matches/hints indicated a “sourced” connection to Francis Taylor III or any of his ancestors including George of Carlisle …. this should have been a “stop sign” for me, or at least a “caution sign” but I blindly drove right past the signs continuing to believe the incorrect information about The Immigrant. In early 2017 I became frustrated with all the matches/hints from AncestryDNA that kept ending after six generations; I decided it was time to graduate from atDNA up to y-DNA. y-DNA, is passed down from father to son, so if you are a male, you will have received your y-DNA father’s father’s father etc. It can be used to connect with distant cousins on the direct male line. Shared markers can indicate relatedness between two men, though not the exact degree of the relationship. Y chromosome testing is most often used by individuals with the same last name to learn if they share a common ancestor. 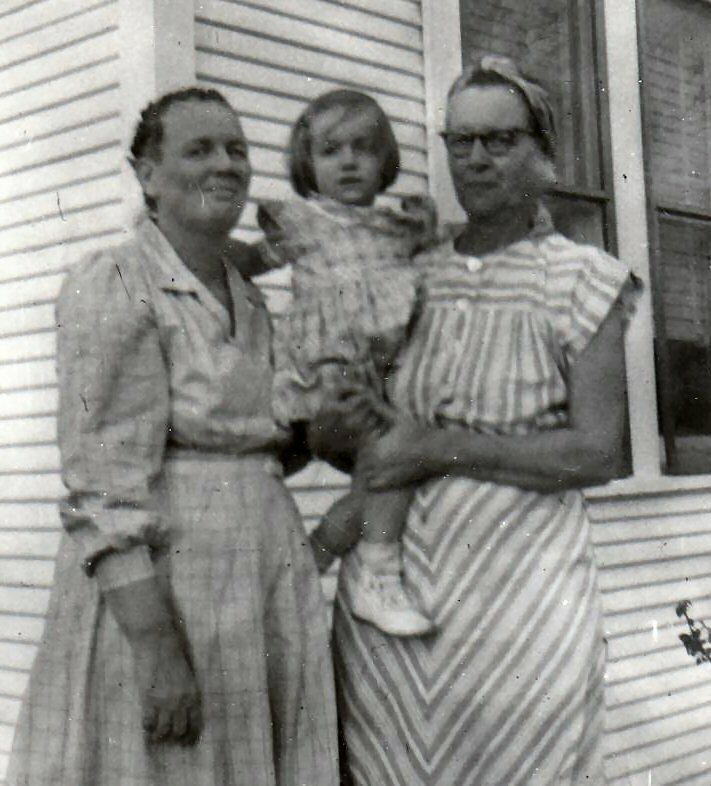 I researched the various commercial providers and decided to use FamilyTreeDNA.com (FTDNA). I firmly believe it was the right choice and a wise move but I had no idea what it would mean to my Taylor pedigree tree. I won’t try to explain the logistics or how FTDNA works other than to say that they appear to operate like a finely tuned machine with exceptional efficiency. FTDNA offers users the opportunity to participate in projects and I joined the Taylor Family Project … almost immediately the results indicated to me that it was time to go On The Taylor Trail Again! Consider this … We were presented with the idea that “our” William Taylor was the son of Francis Taylor III and this was based solely on the fact that Francis T III listed one of his sons as being named “William” in his will. Undoubtedly, there were hundreds of William Taylors in the colonies at this time and there appears to be no proof whatsoever that the son of Francis Taylor III was “our” William Taylor other than the fact that they shared the same (very common) name! Another conundrum that comes into play here is the fact that none of “our” William Taylor’s children were named after Francis T III, his wife or his children. Naming patterns were an important part of family life in 1700-1800 colonial America and were very obviously present in many generations of our Taylor line (during this time period), but none are present in the alleged father-son connection of Francis T III to William Taylor. These circumstances along with the scientific DNA evidence indicates at least to me that GEORGE TAYLOR OF CARLISLE IS NOT MY IMMIGRANT ANCESTOR AND FRANCIS TAYLOR III IS NOT IN MY TAYLOR LINEAGE. A week after receiving the first comparison report, I received the comparison report on mine and the DNA of “Subject Two” …. Without going into too much scientific detail it basically said that “Subject Two” and I were related sharing 30 identical values in 32 markers tested in common; more importantly it placed both of us in the almost rare “G” haplogroup. This meant that the likelihood of my descending from William Taylor through his son, Barzilla, was very strong. Unfortunately (or fortunately, depending how you look at it), those y-DNA comparison results and the circumstantial evidence meant it was time to make some substantial corrections to our recorded family history and to go back On The Taylor Trail Again to find the Immigrant Ancestor! The lesson to be learned here was both profound and simple … DNA testing can prove a perceived family relationship, BUT it can also disprove that same perceived family relationship and you need to be able to accept the test results. If it is exact enough to be accepted as evidence in a court of law then you should be able to modify your pedigree tree based on the results of DNA testing. Remember, y-DNA can tell us if two individuals (who’ve been tested) match or not. If they match, they share a common paternal ancestor but the y-DNA test results cannot identify that specific paternal ancestor; only when supported by acceptable, sourced documentation can such identification be accomplished. If they don’t match, they have different (biological) paternal ancestors. These photos are primarily WALKER, Smithen & related families. Most were taken in and around Navarro Co. & Ellis Co. Texas … Blooming Grove, Ensign, Lone Cedar, Corsicana, Cryer Creek, Dresden. 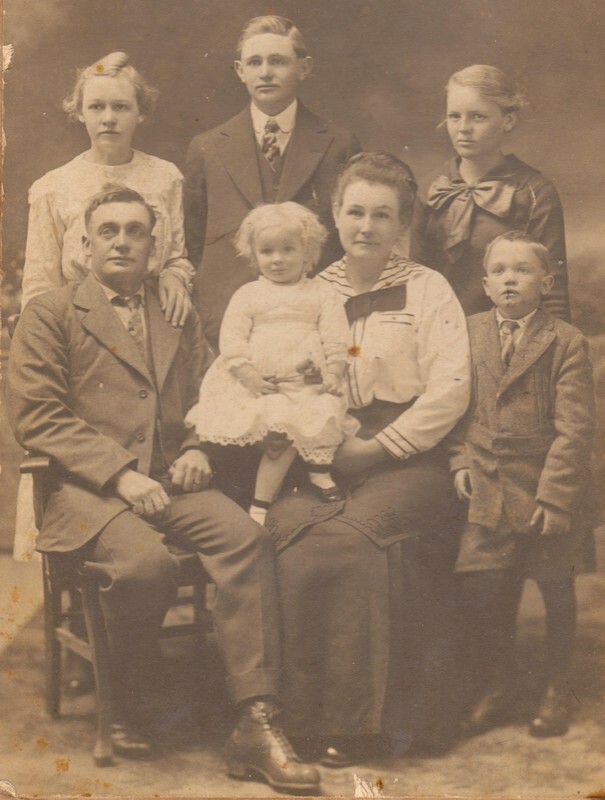 Many of these have been previously published on my Ancestry.com family tree but I felt they would be more accessible to others via this website. If I have misidentified anyone or if any caption requires modification, please email me at the address listed on my “Contact” page of this website. If you have any photos you feel are related to these families that you would like posted on this website, please email me. Before using any photograph from this website, please read the letter posted on May 1, 2016, entitled RELEASE OF PHOTOGRAPHS.